Maynard Stow Baseball succeesses are because of your willingness to volunteer. We take pride of the way we maintain our home field, Crowe Park. To provide a full overall quality experience for players, parents, friends and the community, we look for your participation. There are three primary areas of volunteering for Maynard Stow baseball. Coaching - Ideally, we would like to see one manager and two to three coaches per team per season. Coaches should have the willingness and knowledge to teach the players proper ways to play the game. 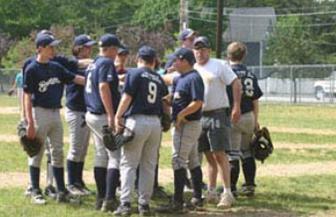 Coaches coordinate and run practices in addition to games. In order to best accomodate personal conflicts, having three to four coaches per team helps maintain the quality of the experience for your team's players. Field and Park Maintenance - More hands make for lighter work. There will be times where it rains the night before a game. We make every effort to play the games as scheduled. This will sometimes require extra hands getting the field ready to play. After each game, with three teams using the field this spring, we rake and fix, the pitcher's mound, home plate and infield. The batting cage mound, plate and netting should be checked. In addition to the field, we are responsible for trash, recycling, and the overall cleanliness of Crowe Park. Snack Shack - Baseball, hot dogs, apple pie... well hot dogs anyways. We prefer to have the Snack Shack open for every game played at our home field. We minimally offer snacks and beverages, with hot dogs. There is a working stove top and oven. Want to put your cooking skills to work? On top of the game day sales, the Snack Shack could use a fresh coat of paint and some maintenance. Practices are good opportunities to put in some assistance, if you would. Maynard Baseball Charitable Corporation is all volunteer. As players age into the program, please consider how you would like to participate in addition to watching the very entertaining games. Board of Directors are regularly seen at the field. We're open to your questions and comments.